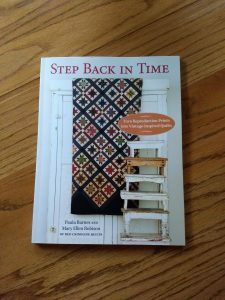 I just received my copy of the new book Step Back In Time by Paula Barnes and Mary Ellen Robison of Red Crinoline Quilts. Even if there weren’t a couple of quilts that I quilted in the book, I would still highly recommend it. There are 13 patterns in the book that are inspired by Civil War quilts, but they would all look good in modern fabrics as well. There is also a story accompanying each quilt, so you get a history lesson as well as the clear and concise instructions for making each quilt. Paula and Mary Ellen are experts in designing and making quilts and you can’t go wrong with their patterns. Paula also designs reproduction fabrics for Marcus Brothers.